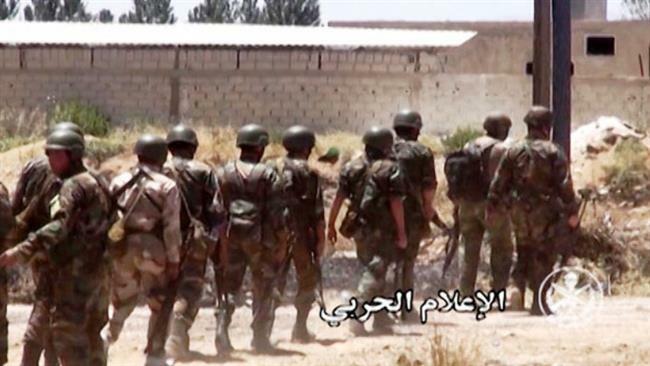 JNN 08 Aug 2015 Damascus : Four Takfiri terrorists surrendered to the government troops in Zabadani region after dozens of their comrades were killed during the clashes in the Damascus countryside. About 4 Ahrar al-Sham terrorists laid down arms and surrendered to the Syrian authorities in Zabadani on Saturday, military sources told FNA on Saturday. The terrorists’ surrender came after ceasefire negotiations between the terrorists and the Syrian government in Zabadani failed. In mid-August, Mohammad Abolqasem, representative of terrorist groups in the ceasefire negotiations with the Syrian army in Zabadani, blamed the Ahrar al-Sham Takfiri terrorist group for the failure of ceasefire talks in the Southwestern Syrian city. “The negotiations were about the safe pullout of the militants from Zabadani in the Western countryside of Damascus in lieu of transfer of civilians from the towns of Kafraya and Fuaa in Idlib to Damascus countryside,” Abolqasem told FNA. On August 7, hundreds of foreign-backed militants surrendered to the government troops in Al-Qalamoun region in Damascus countryside, Syria’s National Reconciliation Committee announced. Earlier today, the Syrian army and the Lebanese Hezbollah resistance movement purged further regions of Takfiri terrorists around the city of Zabadani in Damascus province. The army units and Hezbollah fighters purged terrorists from Al-Beit mosque and al-Azimeh street and the surrounding buildings. The Syrian military sources said that the militants who are besieged in Zabadani, specially Ahrar al-Sham terrorists, are in a very bad situation. On Wednesday, the Syrian Army and the Lebanese Hezbollah Resistance Movement took back Syria’s border town of Zabadani from the terrorists. Zabadani was freed after a ceasefire plan went into effect three times and the two sides accepted to hold fire in the border region. According to the ceasefire plan, the two sides would provide safe passage for enemy troops to withdraw from those regions. But the plan failed after one of the main militant groups violated the ceasefire terms. This entry was posted in Middle East and tagged Ahrar al-Sham, hezbollah fighters, Surrender, Syrian Forces, Zabadani. Bookmark the permalink.